Compare prices on car hire in Barcelona from all the major brands and find the best deals. When you book through us, unlimited mileage and insurance are always included in the price given. 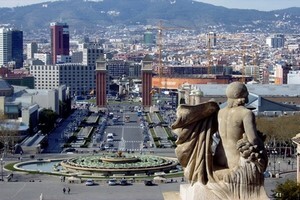 Barcelona is Spain’s second largest city.It is located in the Catalonia region. There were 1.6 million in Barcelona in 2007. The suburbs may be 3 million plus on. Its location in the north-east by the Mediterranean Sea makes it to Spain’s most important traffic hub and port city. Barcelona has rich cultural traditions. In 1992 Summer Olympics held here, which in retrospect has stimulated tourism. Already in 1450 the city got its own university, and the castle as the Counts of Barcelona built around the same time, can still be visited. Otherwise, the city show a number of historical sites, where several of them are on UNESCO’s World Heritage List. Art buffs should definitely pick up the Picasso Museum. Barcelona is also one of Spain’s most important industrial cities, with particular emphasis on automotive (SEAT, Nissan), mechanical, chemical and textile industries. The city has three airports. The largest is the El Prat International Airport 12 km west of downtown. Booking car rental in Barcelona is safe and affordable through Car-hire.net. Select a location in Barcelona you want to retrieve the car and delivery location. (The price for one-way rental is included). Select the desired car and enter your credit card details. After a few hours you will receive a confirmation of order.